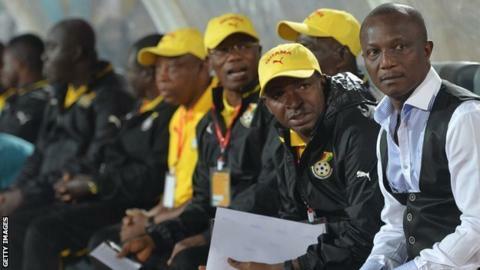 Ghana coach Kwesi Appiah is preparing to name his World Cup squad on Monday, having already said he has a fair idea of the players he intends to take to Brazil. Yet that has not stopped intense debate in the country over who should be on the plane to Brazil and the factors that should influence those choices. Appiah is in a unique position. He is heading to Brazil as the first Ghanaian coach to take charge of a Black Stars squad at a World Cup, joining a select group of African coaches to have managed on the biggest stage in world football. He has risen to that level after assisting Serbian Milovan Rajevac in 2010, when Ghana reached the second round, and says he has learned enough lessons from that tournament to influence the choices he makes ahead of Brazil 2014. One of those lessons, inevitably, will be creating the right blend of old and new for this year's campaign. Ghana's previous World Cup squads have featured some experienced and strong characters. Michael Essien, Sulley Muntari and Asamoah Gyan are all key figures and will be prominent members of the squad in Brazil too. But some of the veterans of the last two World Cups are sweating over their places and are likely to be disappointed. Veteran goalkeeper Richard Kingson is one of them. His brother, the former Hearts midfielder Laryea Kingston reckons his elder brother must be part of the squad. He is unlikely to get in. Aside from Kingson, the debate has focused heavily on what to do with former captain John Mensah and his fellow defender Isaac Vorsah. It is a debate fuelled by a consensus that Ghana's defence is its major weakness. The former Bayern Munich defender Samuel Osei Kuffour has claimed that there is a lack of leadership at the centre of the Black Stars' defence and reckons the inclusion of Mensah and Vorsah would solve that problem. The problem is that the regular centre back pairing have been heavily short on match practice and fitness over the last year. Mensah has not played for Ghana for two years. Vorsah's last appearance was in March 2013, in Sudan. And to compound matters for Appiah, both players have had major injury problems to contend with. Mensah's attempt at a comeback in Slovakia was stalled by a recurrence of a back injury two months ago. Vorsah, meanwhile, picked up a knee injury last May at club side Red Bull Salzburg and has not played since. In addition to that central defensive problem, Appiah must figure out how to satisfy a growing band of Ghanaian fans who insist that he must include home based players as a statement of faith in the domestic Ghana league. Appiah has insisted he has faith in those players and promised that he has some in mind. The make-up of his squad will prove whether he has backed those words with action.